We have some pretty exciting workshops and special events coming up. Have a look to see what may interest you. There are various price ranges to suit everyone’s budget. Spaces are limited. Pre-registration is required. See you soon at the farm. Our theme for this workshop is Spring into Spring. Participate in hands on, experiential activities with the horses, helping you to Renew and Re-energize from the long winter we have had. Bring just yourself or bring some friends. There is no riding involved and no horse experience required. 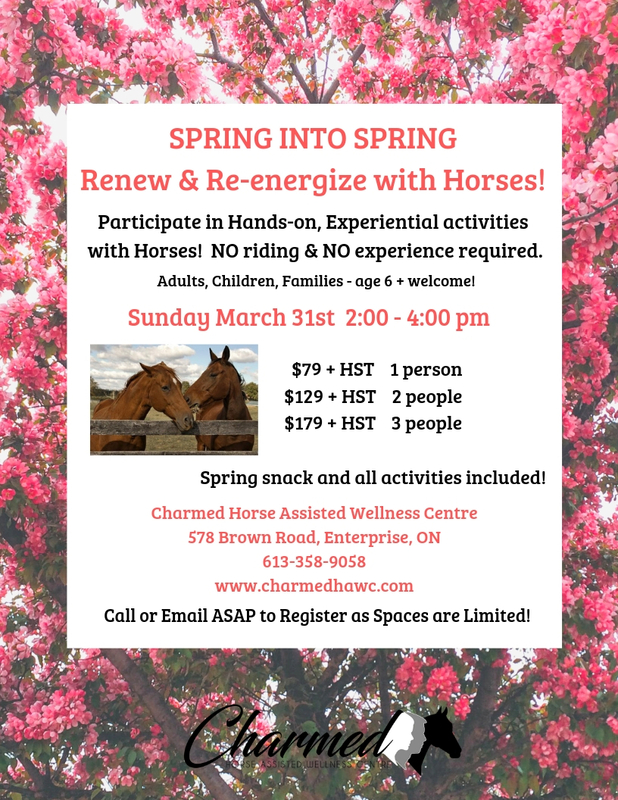 The Wellness Team will guide you through a relaxing afternoon of activities with the horses, aimed to help you slough off the winter blahs, and start off this spring feeling like your best self. 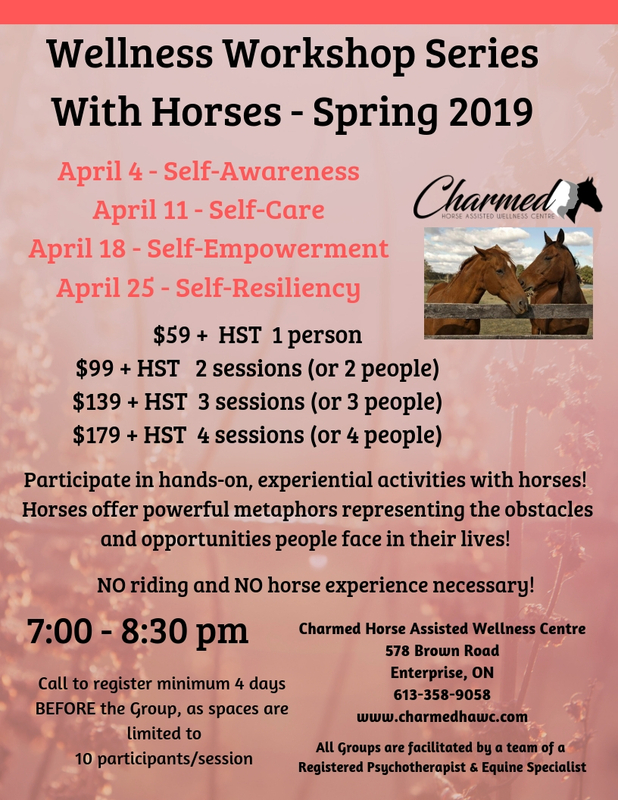 On March 31st, 2019, from 2:00 pm to 4:00 pm, Charmed Horse Assisted Wellness Centre will be hosting this workshop just in time for Spring. Enjoy delightful spring inspired snacks and light refreshments. Spaces are limited. Pre-registration is required by Wednesday, March 27th. Would you like to be more in tune with your inner self, build self awareness, learn what self care means to you, become more empowered, and develop a stronger sense of resiliency, if so, this Wellness Workshop Series is for you. The exciting thing about this series of topics, is that you can choose one or more topics that interest you at an affordable cost, or bring a friend or friends at a reduced cost to enjoy the evening with, while you all learn about yourselves, through activities with the horses. The Wellness Team will guide you through each topic, aiming for self improvement and enlightenment for a better, stronger YOU. Each topic as noted on the flyer will be held from 7:00 pm to 8:30 pm at Charmed Horse Assisted Wellness Centre. There is no riding involved and no horse experience is required. Spaces are limited. Pre-registration is required 48 hours prior to each topic date. Please wear closed footwear, no sandals. What better way to celebrate the mother figure in your life, than to accompany them out to the farm and show them just how much you care for all they have done for you. The afternoon will begin with the Wellness Team guiding you both through some activities with the horses, aimed at strengthening the bond between you, leaving you both with a sense of calm and empowerment. Afterwards, a special Mother’s Day tea, sandwiches and desserts will be served. Then to top off this special day, included in this exciting package is either a mini manicure by the Mudhouse Spa from Kingston, or an essential oils treatment with complimentary sample, by Anita Brown. 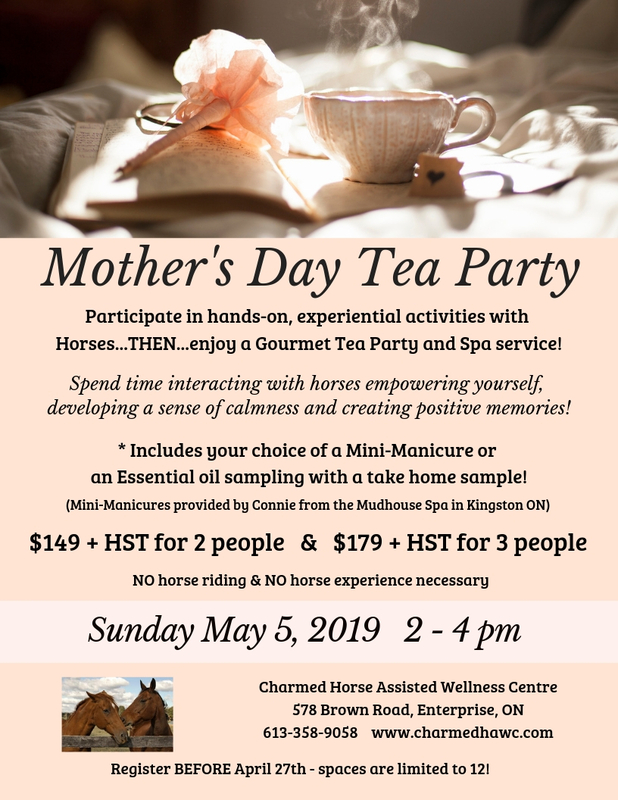 The fun takes place on Sunday, May 5th, 2019 from 2:00 pm to 4:00 pm at Charmed Horse Assisted Wellness Centre. There is no riding involved and no horse experience is required. Please wear closed footwear, no sandals. Spaces are limited. Pre-registration is required by Saturday, April 27th.